There are times when you want to celebrate little things with your loved one in complete tranquility and privacy. For such beautiful moments you can go for a simple and romantic room decor. Surprise your partner for his anniversary, birthday or a special news you have to share with helium balloons, handmade delicious chocolates and rose petals. We have got your back even on last minute. So don't hesitate and show your love!! Watch your partner go awww when they walk into a room full divine smelling rose petals saying a beautiful message - “happy anniversary”, “ I love you”, Happy Birthday”. No we did not forget to add “Kuch Meetha” to celebrate. 12 Helium balloons in romantic shades of red and white tied down with photographs complete your celebration pack! 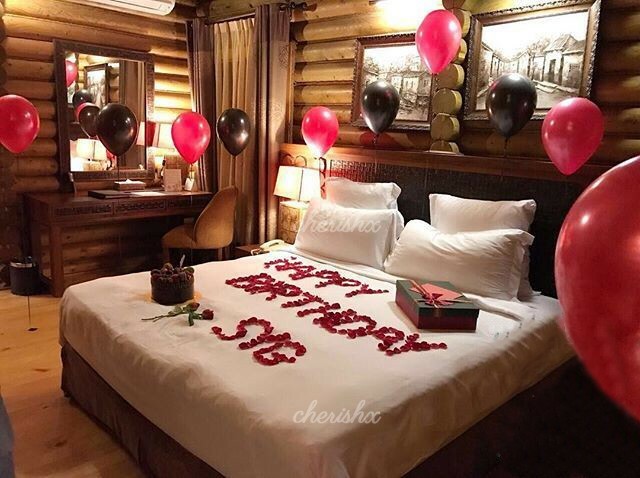 You can have this incredible setup at home and surprise your partner on your special occasion. Add one more helium balloon.